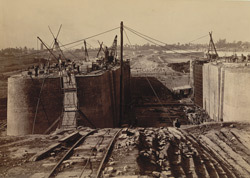 Photograph of the Calcutta Docks taken in1886 by an unknown photographer showing the double entrance from the half-tide basin to the dock and the gates in position. The Calcutta Port is the only major riverine port in India and constitutes the Calcutta Dock System. The entrance to the dock was to be through a tidal basin about 600 ft by 650 ft, and from the tidal basin to the river were two entrances, one 80ft wide and the other 60 ft. Generally, the gates would open about two hours before high-tide when the water in the river and tidal basin would be at the same level . The lock was used to let cargo boats in and out at all times of the tide.